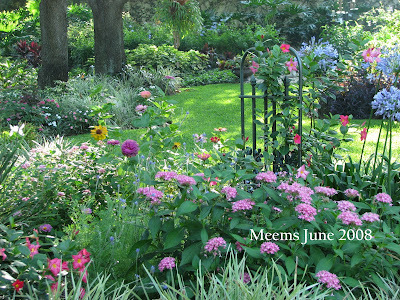 Looking at my garden today it is a far stretch to remember back to last summer when there weren't very many empty spaces in the planting beds and color was everywhere. It's good there are photos to preserve memories of better times. Because, at this point, even the way the garden looked in January is hard to recall right now. Things are pretty drab and downright barren from all the dead and damage pruned away from the freezes. 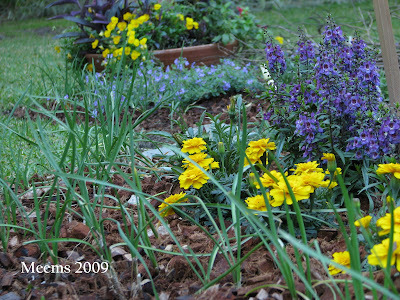 and the veggie garden flowers continuing to bloom... we would nearly be colorless at Hoe and Shovel. Oh, the shame. 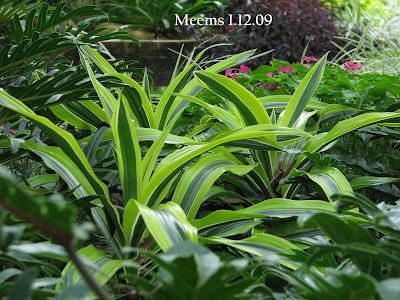 Lemon lime dracaena ... a memory. It's a good thing the trellis isn't all wrapped up in the pretty pink diplademia that used to thrive on it. Now the (very large one) dragonfly has a clear landing. The garden IS all a-flutter with our feathered friends nesting and scurrying back and forth to the feeders and watering sites. This week as I've spent countless hours in the garden cleaning up the mess and putting the finishing touches on the veggie garden, I've snapped a few photos along the way of my garden friends. 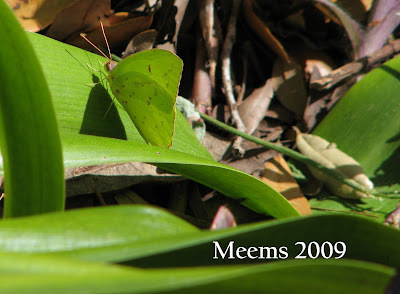 Can you see the camouflaged sulphur butterfly? As I watched her flutter around the garden this afternoon, waiting for her to land, I was willing her to... "land on the red salvia" or "the red geranium." But instead she chose the green that is the same color as her wings. ... And the lizard that tried to snag her while I was standing right there. I didn't even know lizards ate butterflies. It was a close call but this time the pretty little thing got away. Those flight wings come in handy. There are lots of woodpeckers chuck-chucking back and forth to each other and flying around in the canopy of oaks. I do appreciate them being near. The Downy's are back too. Sorry no photos of them either. Just the sounds of them keeping me company. 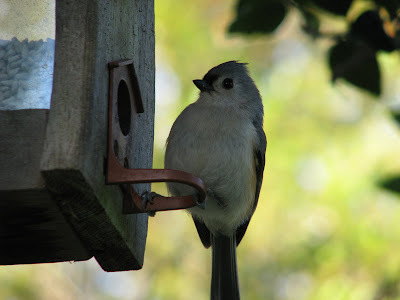 These little fellows are one of my favorites with their sweet little blue grey feathers and those round, bright eyes. Spring is knocking at the door. As winter drifts slowly from the north to the south... so spring floats upward from the south to the north. What we have here now, my northern friends, you will soon be enjoying, too. Great photos! Your dragonfly is a cool one, Ditymops transversa, Stream Cruiser a female. The sulphur is a Cloudless Sulkphur, we see lots of those in the fall but not many in the spring, yours likely over wintered. Hi Meems, what a wonderful way to wake up this morning. I love looking at your garden in any season, you have created a garden paradise. The bird shots are spectacular! The woodpeckers, wrens, titmice and chickadees all are residents here too year around. Your butterfly was really well camouflaged, except to the lizard! Glad the flutterby got away this time! Wow. You know the names of dragonflies, too. I am so intrigued by them... coming in so many colors and sizes. The cloudless sulphurs must be a hardy lot. They are the ones that came out on the first sunny day after the freeze. I've seen monarchs and swallowtails and lots of skippers in the past few weeks too. But not nearly as many as I will visit me in the coming weeks. Your words are kind and generous. BUT... hardly a paradise right now. I've been steadily piling any part that was paradise into the debris pile. Signs of new growth everywhere is the up side. We just won't start out as full and lush as we typically do in spring. Don't you just love the loyal year round friends... they make great company through my long days in the beautiful outdoors. 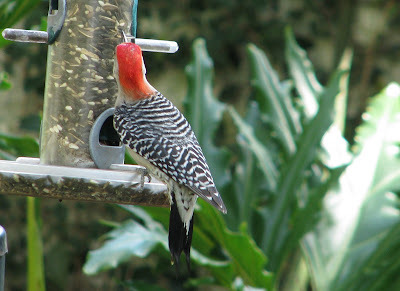 We have lots of woodpeckers, but I have never seen one at a feeder. We seem to have the same flighty crew here on Pollywog Creek: a huge flock of goldfinches, a pair of cardinals, 2 green and 1 male painted bunting, a loggerhead shrike, a mockingbird, and yellow-rumped warblers. 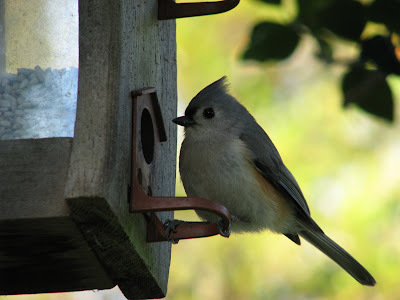 I'm still waiting on the tufted titmouse to appear. I think we are going to wait until after our trip to Nashville this month before we prune. I have fought off whining but this week "feeling" the reality of what is gone has been a challenge. I keep telling myself- "It's just a garden and besides... it will grow!" And then there's the promise of all the new sprouts shooting up in the veggie garden. woo-hoo! Oh, I forgot to include the goldfinches. There are so many of them that many of my underplantings are polka dot with their white poo. I don't mind ... their sweet little songs all day long are quite a treat. YOU have a shrike and buntings... we've never had either one of those here. I've not been able to get photos of the mockingbird or the tiny warblers yet.Most of my photos come in the form of grab and snap while I'm working. I did stop the mower to get a photo of the dragonfly yesterday... that's because she was SO big. I got so excited about your bunting and shrike that I forgot to address the woodpeckers at the feeders. There are no less than 8 or 10 red-bellied woodpeckers hanging around these days. Nesting I'm sure. They are here year round but right now making their presence known in every way. The way they call back and forth to each other is one of my favorite garden tunes. They have found any easy way to feed and are getting quite comfortable at each of my feeders. 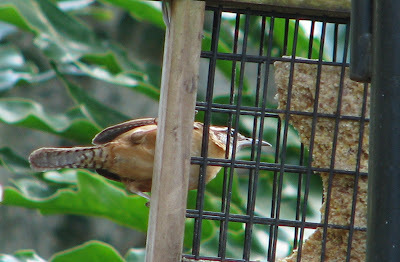 The children really love seeing them at the feeders, too. I echo Frances, Meems. I love looking at your garden in any season too! It's nothing short of fabulous! I know that you see what's missing in your garden, we still see so much beauty! Lovely colorful birds to help lift your spirits too. Oh! Love yore loca critters!! Thank you, Meems, for that hopeful note at the end. I know your garden isn't as colorful as it usually is, but it is still a feast for these winter-weary eyes. Your feathered friends seem to be enjoying it as well. Meems have no fear mother nature has a way of making things revive with such gusto for life that we all think it is a miracle. my pink mandevilla died here too I believe it is too hot. The dry season has started with a blast and am watering every day now. My water bill will be a big one and I dread receiving it. I am going to hold a plant sale soon to rid myself of some excess stock I have. By the way, I am planning a trip in May for my daughters graduation and will be spending a week in South Florida. I am hoping to fit in a visit Appopka , I have a cousin who lives there. I am planning to visit many of the nurseries there. Are you anywhere near there? This is just a whim of mine and I hope that I can do that and visit you as well. 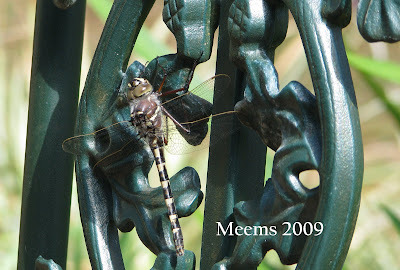 Oh Meems, the dragonfly is wonderful! As are all your others friends. How great to have all that company while working in the gardens. I know you are suffering plant loss shock, but just think how they will come back bigger and better. 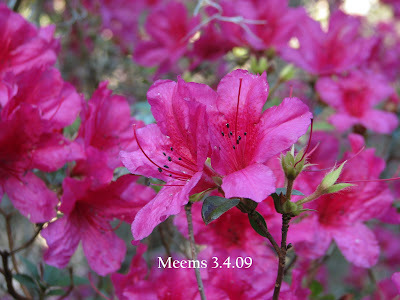 Your garden is always heavenly! 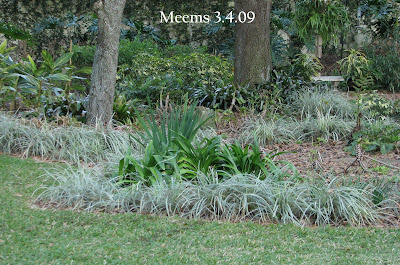 I keep thinking of planting caladiums here beneath my azaleas after seeing your gorgeous photos from before. Heading out into the garden now. It's to be 61 and sunny here today. Off I go! I can see that you'll never be lonely out in your garden with so much great company attending to their business. I have to say that I didn't know lizards eat butterflies either. Soon your garden will be back to its original glory - I have no doubt. But a little rain would help! Great shots of the wildlife in your garden! We're a warm and sunny 48 degrees right now, and hopefully I'll be able to get out in the garden and do some cleaning up tomorrow. Unfortunately I have to work today or I'd be out there now. Your shot of the June gardens looks like paradise. It's so beautiful. Truly incredible. I'm sorry to hear about all of your losses from the freezes. Gardening sometimes feels like one step forward and two steps back. 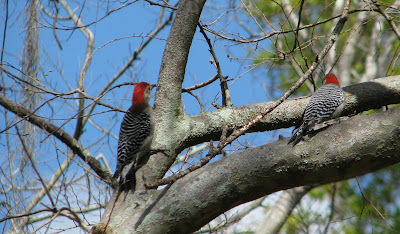 I love the bird shots, especially the Red-Bellied Woodpeckers. You are right. The birds are such a gift! All their songs and flitting about... I just adore them. The critters are so fun to observe. I know the blooms will come. Some of the greenery is completely stripped away, too. But I'm noticing each day new green budding out very fast. You are very kind. It is all relative I suppose. It is true. Nature has its course and it will be what it is deemed to be. In a few months I'll probably have to come back to the recent photos to remember how badly it looked. Apopka is only about 2 hours away. So YES, if you get this close you must come here. That would be great! Keep me posted as to your 'whim' plans and progress. I promise. It is the way it works. Winter doesn't show up here until much later than the north. And spring doesn't show up there until much later than the south. The earth is giving us 'every' sign of spring here so it must be on its way to you too! Well, I just dumped all my brown... well at least most of it. As I walk around I see some I've missed but it is easy to work on what's left. All the major brown is cut back. I DO like green. Truly that's why I live here... I couldn't manage without it. Funny story about the lizard and the docent. 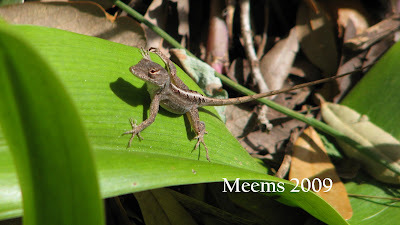 What was funny was that my camera was pointed at the butterfly and I 'heard' the lizard in the dry leaves but just as I stopped clicking ... there he was after snapping at the butterfly that narrowly escaped. You learn something new when you keep your eyes open. This is the time of year I start thinking about the caladiums coming back, too. I just (this week) ordered 350 more bulbs. They won't be delivered until May. I like to plant mine late. That way I can see what comes back and then I fill in the empty spots. I hope you do try them. Maybe in a container where the soil gets nice and warm? We are desperate for rain... just like you. Spring is our dry season and now the county is considering even tighter watering limits. ACK. We are down to once a week for any automatic irrigation. That isn't enough with our heat. Sunny is key! sun feels good in any temperature doesn't it? Hope you get out in it tomorrow... it will be good for your soul. The woodpeckers are fascinating aren't they? Welcome to H&S... glad you liked the June photo. This site is totally sumptuous-You have created a little piece of paradise for all to enjoy. Thank you! Meems, such a pleasure going through your photos. Just lovely...the plants, the birds, and other wildlife. Kudos on the butterfly shot!I have never been able to get one.It's always that DDCD! And your garden is gorgeous!One can only dream. Thank god your garden looks drab too! If your's looked good, I might quit the hobby altogether. ("It will never look as good as Meems'!! Wahh!!) At least I know someone else is in the same boat!!! I heard a woodpecker outside this morning when I first woke up and he was really going to town! I couldn't find him though. Robins will overwinter here if they can find food and we always have some throughout the winter. Until this year! But they're back in our yard as of last week. When the red-winged blackbirds are back, then we know that spring has arrived! 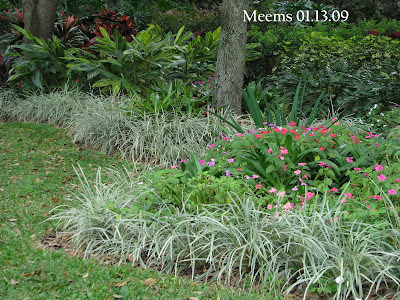 Your garden is beautiful, Meems. I can hear the birds twittering back and forth between the feeders, contented, knowing that this garden is friendly. 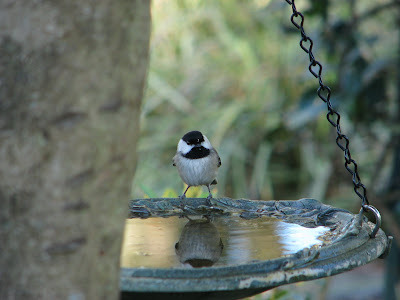 All of the photos are outstanding but the chickadee on the birdbath with his reflection in the water... love it. My dear meems, I am sighing with you...and know that before long you will make the best tasting lemonade from the big bag of lemons winter left you! It will be delicious and refreshing. I thought this post would be about the peacocks. Did you get rid of them? As you know we do not have a lot of nice things to say about this place that we now call home...except we have some of the most beautiful birds! I being the Floridian that I am did not notice many birds besides gulls and pelicans so this is all new to me. Your pictures are stunning as usual. We are heading south to defrost in a couple of weeks and I would love to see your garden! Can we stop by? I might even bring the mom along? And of course I would not forget my kiddos, you haven't see Josiah since he was a little guy. Sorry about your freezes. At least there is green down there. I have heard that it has been quite cool. I guess we are all experiencing weather anomalies. The garden still looks quite lovely to me. Good morning Meems! I can imagine how it must feel seeing the damage nature wrought in your garden this winter and having so much work to do getting it back in shape. 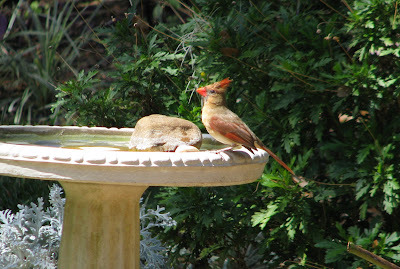 How sweet of the birdies and other critters inviting you to pause and enjoy their company. Thank you. Good to have you here. It has been fun being out in the garden where everything is moving about and the world is coming alive. Thank you for coming along. Those sulphurs are quick aren't they? I think I just caught this one resting. WG: You folks got so much more cold than we did you must be ready for spring. I hope it helps to know we are starting from scratch in some places... but already new green is popping out everywhere. If you ever get this way I've some pink firespike for you. Ohhhh how I love the activity in the garden right now. Your hearing is right in tune. LOL I was happy to get that photo of the quick little chickadee. Unlike my usual 50 pictures and choose the best... that ONE of the chickadee was my only shot... and it worked. Whew. I bet you heard a downy?? What do you think? I always hear them pounding away and then have to zero in on where they are among the branches to see them... they are SO cute. I've been seeing (and hearing) a couple of them but haven't gotten a good photo yet. I like the thought of 'winter flowers'. And now that you mention it, when I see your photos, they do look like flowers among the winter white. I do hope my whining wasn't so loud. But I think you could hear it through my words... and I promised not to do it. Silly me. I am so glad you dropped by with your words of encouragement. The cycle of life is ever a wonder and this time of year it is as if the whole earth is rejoicing for the new season at hand. The birdies are voracious at the feeders, too. It has been a glorious week weatherwise and my time in the garden has been concentrated ...so lots of checks off the list. Thank you. Yes, we do have green and for that I am very grateful. I guess I take it for granted that we actually stay green all winter. It did take me by surprise how much damage there was as the weeks went by. Seems the dead got deader and THAT is what I'm not used to. BUT, since I'm resolved not to whine about it... let's just say it's been a lesson in tenacity. We take our risks with gardening and there is always something to learn. the critters make very good companions and provide so much free entertainment while working. Meems - I might track you down for some firespike! Looks like TONS of color in your neck of the woods. Just lovely. I have to get a chuckle about your occupation, I think it is mine too-chief blogger-I'm not getting paid in cash though! Gotta fix that one of these days. Then I can of course buy more plants. Have a great weekend Meems. I bet Marmee is out and about, beautiful spring weather here. Enjoy your warm weather while you can! Let me know the next time you come up this way! It must be heartbreaking to see all the frost damage to your beautiful garden, especially after looking at that glorious last summer's garden photo. I'm glad all the new signs of growth are at least giving you reassurance of what's to come. Aren't the birds delightful companions? Sometimes it's hard to get any work done because of all the stops taken for snapping photographs..at least for me :) Your shots are wonderful! Rain (and maybe snow) is in the forecast again and the skies are gloomy here today, but never mind....Spring is in the air! Yay! I love your bird photos. I need to add a bird bath to my garden. I get some cardinals at the feeder, but I'm definitely missing out. Fantastic.